Scientists used 3D regional ocean model simulations and sediment trap data to investigate how large (mesoscale) and small (submesoscale) circulations affect the transport of sinking particles, or marine snow, in the northern Gulf of Mexico. Small-scale convergence and divergence processes (a few kilometers) and cross-shore transport of riverine inputs induced by mesoscale eddies significantly influenced the speed and trajectory of sinking particles in offshore waters. Mesoscale eddies and fronts influenced the riverine water content, seasonal nutrient influx, and the size and shape of the catchment area (above sediment traps), and submesoscale circulations accelerated particle descent. The results suggest that horizontal advective motions can transport sinking particles laterally from afar and that particles above a deep trap may not be represented in the material collected by the trap. The researchers published their findings in Elementa: Science of the Anthropocene: The influence of mesoscale and submesoscale circulation on sinking particles in the northern Gulf of Mexico. The settling of marine particles (organic and inorganic materials such as plankton, detritus, bacteria, and minerals) from surface to deep waters plays an important role in the ocean’s carbon cycle. Pollutants in the water column such as oil can become attached to sinking particles and be transported to the seafloor, which happened at an unprecedented scale during the Deepwater Horizon incident. Researchers routinely use sediment traps to collect and study sinking particle fluxes, which are usually considered as coming from a Gaussian or bell-curved catchment area (tens of kilometers in size) above the trap; however, previous research suggests that may not always be the case. 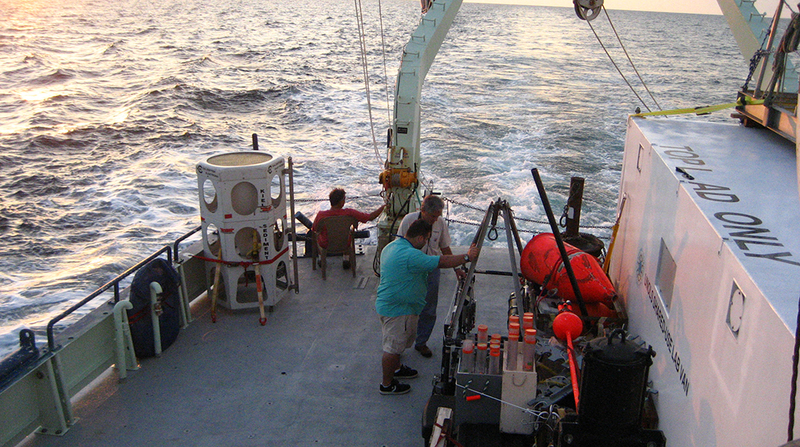 To learn more about the origination point of sinking marine particles and their horizontal and vertical trajectory, the researchers in this study reconstructed several thousand particle trajectories at two sediment traps – one near the Gulf’s largest natural seep (GC600, 1,000+ meters depth) and one non-seep trap (AT357, 120 meters above the seafloor). Their collection periods were April 20-30 and October 2-12, 2012, covering times when particles collected in the trap would likely have been near the sea surface. The team ran regional ocean model simulations at 1-km resolution and compared results with sediment trap data. Particulate organic carbon (POC) concentrations between the two traps were similar in the spring, diverged slightly and realigned throughout the summer months, and presented large differences in the fall when fluxes at the natural seep sight greatly exceeded the non-seep site. The trap at the non-seep site was slightly shallower, less prone to direct impact from Loop Current eddies, and exhibited a statistically significant correlation between POC concentrations and freshwater riverine discharge. The trap at the natural seep site encountered Loop Current eddies more often and did not exhibit covariance between POC concentrations and riverine discharge. The cone of influence for fast-sinking particles (100 m d-1 velocity or higher) was typically limited to an area of tens of kilometers, but it could extend to several hundred kilometers for slower-sinking particles (50 m d-1velocity or less). The large majority of modeled particles reached the bottom faster than would be expected by their sinking speeds alone. This finding is associated with submesoscale-induced horizontal convergence in the mixed layer that aggregates particles preferentially in downwelling regions, accelerating their descent. The authors noted that this study demonstrates that the highly-complex variability of vertical fluxes in the Gulf of Mexico can be understood only by considering the mesoscale circulation and seasonal cycle of primary productivity, which in turn are linked to riverine inputs, wind forcing, and the seasonal cycle of the mixed-layer depth. Data are publicly available through the Gulf of Mexico Research Initiative Information and Data Cooperative (GRIIDC) at doi:10.7266/N7H993KF, doi:10.7266/N7PN93PS, doi:10.7266/N7JW8BXM, doi:10.7266/N7KP80MP, and doi:10.7266/N7NP22XW. The study’s authors are Guangpeng Liu, Annalisa Bracco, and Uta Passow. This article originally appeared online here. This research was made possible in part by a grant from the Gulf of Mexico Research Initiative (GoMRI) to the Ecosystem Impacts of Oil and Gas Inputs to the Gulf-2 (ECOGIG-2).